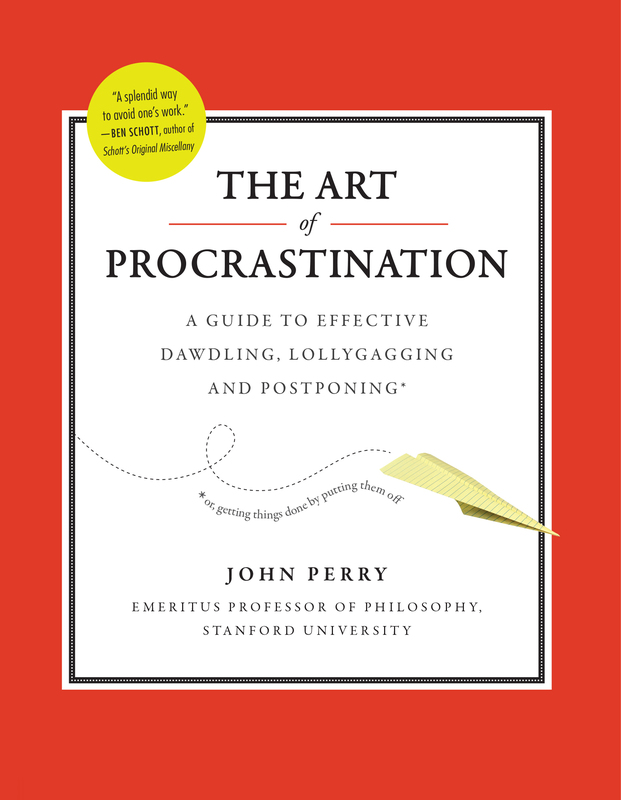 John Perry is emeritus professor of philosophy at Stanford University and the author of The Art of Procrastination: A Guide to Effective Dawdling, Lollygaggy and Postponing. In it, he points out that many successful people are actually “structured” procrastinators—those who get a lot done by not doing other things. CMOS: Your book The Art of Procrastination (2012) grew from the essay “Structured Procrastination” (1995). Has the book reflected—or affected—your philosophy of procrastination? JP: The story confirms the theory. The book was but an occasional thought until I won the “Ig-Nobel Prize in Literature” in 2011 for the essay. The prize goes to work that first makes you laugh and then makes you think. An agent called me and asked if I wanted to turn the essay into a book. At that point I was overdue in submitting a book on free will to Oxford University Press. I immediately started work on the procrastination book as a way of putting off that daunting project. Structured Procrastination in action! JP: Well . . . beats me. It must have been in there all along but blocked by various things. A day spent on a dissertation may just make it clear to you that your idea isn’t so good. Or set you up for a disastrous conference with your advisor. Or lead you to the conclusion that your advisor’s ideas are naught but hot air and mirrors, which you will then have to hide from her or confront her about. Or all sorts of other things—unrealistic fears, we hope, but real, at least at times, for the ordinary dissertation writer. These fears block the release of energy. But who fears screwing up cleaning the garage? You start, you work, and you have a clean garage, or at least a cleaner one. Your ego isn’t at stake. Your relations with your advisor aren’t at stake. If I decided to do yoga—much less become a yoga instructor—that’s the sort of thing that would drive me back to my dissertation or my free-will book. That stuff hurts. And you are inevitably around people who remind you what a defective physical specimen you are. CMOS: How much planning do you think the procrastinator should do? Is it important to write tasks down, and how much does task size matter? JP: I think it is very helpful for the procrastinator to write tasks down and to break them into smaller ones. I probably wouldn’t write down “clean out the garage” but “1. Clean off the workbench; 2. Make a pile for Goodwill; 3. Take a break; 4. Sweep the floor,” etc. Then after finishing each (sort of) small task, I get the subjective reward of having done something, and if I have written down the list, of crossing off that task. Then maybe I can leave the list around where someone will see it and tell me how industrious I am. CMOS: How can dawdlers and lollygaggers preempt or at least mitigate the social or professional fallout that often comes from procrastinating? Can you recommend any language to help procrastinators explain to nonprocrastinators what may seem like delinquent behavior? CMOS: Is there really any such thing as a nonprocrastinator? JP: I think so. People with neat desks, empty in-boxes, full out-boxes, who take off for a game of golf or tennis on Wednesday afternoon without feelings of guilt. My friend Marilyn Adams finished her dissertation at Cornell in three years. A lovely person, but a nonprocrastinator, as far as I can tell. But who knows? Maybe her work on Occam was a way of not learning to play the electric guitar. CMOS: What is it about writing that brings out the procrastinator in so many of us? Do you think procrastination is a necessary part of the writing process? JP: Many writing tasks are related to a person’s sense of themselves—how creative they are, how important their ideas are. And they can lead to all kind of rejection: your article is turned down, or it’s accepted and no one pays any attention to it, or they do but only to poke holes. Such situations are perfect for the procrastination syndrome to settle in. But I don’t think it’s necessary. Confident people may not have such worries. If writing is a daily task approached in a business-like way, procrastination may not be a problem—or if it is, the procrastinator may quickly move on to another job. Some people just love to write, from dawn to dust, but have trouble editing. CMOS: What about deadlines that really are critical to meet? How can the procrastinator face up to or prepare for those? JP: Many procrastinators develop good abilities for last-minute work, pulling all-nighters to meet deadlines. Preparing reminders ahead of time is a good idea. These days your computer can tell you with increasing frequency: “Such-and-such due, quit procrastinating.” If a procrastinator is honest, she can have a talk with herself well ahead of time to the effect that she will procrastinate, but it has to come to an end, and why and when. If you can’t manage to develop such skills, you may need to find another sort of job. CMOS: You wrote the essay “Structured Procrastination” twenty years ago, in 1995. Do the advent of Netflix, Twitter, Tumblr, texting, and Taylor Swift call for any serious modifications of the art of procrastination? How can the digital-age procrastinator resist such siren songs, or should we even try to? JP: I’ve been meaning to find out what Tumblr is, but I never get around to it. Twitter, Facebook, and e-mail all make us glad for procrastinators who don’t immediately reply to our e-mails and expect us to do so too, who presumably have the same urge as others to tell us what they ate for breakfast but don’t get around to it. But the Internet and the like pose new challenges. You can waste a lot of time. You start out with good intentions, reading your e-mail. You follow a link to something interesting and worthwhile. But then there is a little box at the bottom promising to show you the ten ugliest Hollywood husbands, or the smallest bikinis ever made, or the five stupidest things skateboarders have done this week. How long can that take? Five minutes, at most. But each site has more boxes, of increasing degrees of titillation and decreasing value for any serious purpose. Pretty soon an hour has gone by. Or two. This never happens to me, of course, but I’ve heard about these problems from others. The solution to this is to treat yourself the way adults treat teenagers with poor self-discipline—that is to say, teenagers. Reminders, threats, cutting off privileges. For most of us, growing up doesn’t mean ceasing to have teenage problems, but learning to anticipate the problems and set up roadblocks. That’s what alarm clocks are all about. The adult goes to bed, setting the alarm clock for his teenage self who won’t get out of bed without it. If you can’t internalize self-discipline, then rely on external devices, which computers are full of. CMOS: Do you see any relationship between your philosophy of procrastination and your scholarly work on philosophy? How might procrastination play into how we understand personal identity and the self, for example? JP: Yes, I see a relation. I resist overintellectualized theories of the self. Hume held a bundle theory of the self. His bundles were impressions and ideas. My bundles are cognitive complexes, structures of beliefs and desires, competing for control of your muscles and limbs—that is, for control of what you actually do. What holds them all together is being part of the same brain connected to the same body. Some people may develop a dominant complex that takes everything into account and makes rational decisions without external help. Not many. Some people may develop self-narratives that guide their life and glue it all together. Not me. CMOS: What is your favorite way to procrastinate? JP: Watching the Giants win.